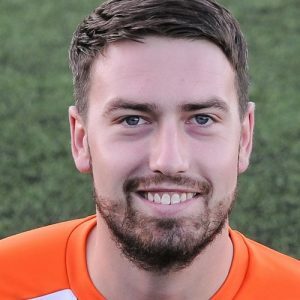 Sam Arnold – 14th clean sheet of the season and not many harder earned than this one..
Khalsa signed off ahead of a week and a half break with a fourth league win on the bounce which propels them up to third in the Midland Football League. Second half goals from Sean Williams and Liam Armstrong made the difference, but for a long time it looked like Khalsa would be unable to break a stubborn Dynamo defence, with keeper Brandon Ganley performing miracles to keep the home side at bay including saving an Alex Woodhouse penalty. But Khalsa keeper Sam Arnold also had to be at the top of his game on the way to his 14thclean sheet of the season. Williams registered the first opportunity on six minutes, an almost carbon copy of his goal at Westfields on Saturday as he cut in, drifted past a couple of defenders and shot, only this time he blazed wide of the target. Five minutes later and Liam Hurst broke free down the left for Shepshed and had to be forced wide by Arnold who then had to make a good stop before Leon Miles cleared in the six yard box. On 21 minutes Arnold pulled off a cracking stop low and to his right to deny the livewire Chris Acott who was all over the pitch. Two minutes later at the other end Josh Thomas forced a save from Ganley and just minutes later Ganley again denied Thomas with a great low stop, the rebound falling to Carlo Franco who couldn’t steer the ball home. Ganley would frustrate Khalsa further on 37 minutes. Thomas was sent crashing to the ground for a clear penalty and up stepped Woodhouse whose powerful low effort was stopped one-handed by Ganley diving to his right. With the first half very much one for the goalkeepers, the second half saw the game settle down a little for the first 20 minutes or so. Arnold produced probably the pick of his stops on 63 minutes, diving full stretch to deny Acott on another of his excursions from defence. Shepshed’s big chance came on 69 minutes as Matt Melbourne danced into the penalty area but shot across goal when he might have done better. On 73 minutes, finally, the deadlock was broken. Franco was upended in the box after good work by Dan Westwood and Williams and a second spot kick given. This time it was the job of Williams to take and he finished in style, finally managing to beat the superhuman Ganley. Another huge opportunity for Shepshed came on 81 minutes, captain Jake Betts putting wide from the easiest of positions with the goal at his mercy. The miss was to prove costly three minutes later when substitute Jay Holdcroft forced – shock – a save from Ganley which eventually ended up with Liam Armstrong who capped an impressive performance with a rasping shot from outside the box into the net. Moving into stoppage time and there was just enough time for Ganley to thwart Khalsa again, Holdcroft’s shot being blocked. Sporting Khalsa: Sam Arnold, Carlo Franco, Alex Woodhouse, Leon Miles, Tes Robinson (captain), Alex Perry, Dave Meese, Liam Armstrong, Dan Westwood (Jay Holdcroft), Josh Thomas (Mensah Kinch), Sean Williams. Subs not used: Mykel Beckley, Shawn Boothe, Nicky Turton.